"He's Our You" is another incredible episode in Lost's fifth season. This episode starts with a classic Lost technique that hasn't been used in a while: Flashbacks. We flashback to the days of young Sayid, in Tikrit Iraq. Sayid's father is forcing his brother to kill a chicken, to prove that he is a man and no longer a child; Sayid intervenes and kills the chicken, so his father won't get mad at his brother. What I love about this scene is the allusion to Eko's story. As seen in "The 23rd Psalm", when Eko was a kid, he killed a man so that Yemi would not be killed. Furthermore, the flashbacks reveal why Sayid boared Flight 316 with Ilana. Ilana was hired by the family of Mr. Avellino, who was killed by Sayid in "The Economist" because of his connection to Widmore. I am glad to see more flashbacks - they have been absent from the storyline for quite some time now. I think it's always good to have a mix of flashbacks, flashforwards, and on-Island/off-Island events. Back on the Island, we see young Ben bring Sayid a sandwich. We know that Ben is eager to learn more about the Hostiles after his encounter with Richard Alpert in the jungle (seen in "The Man Behind the Curtain"). Ben tells Sayid that he has been very patient - and that if heis patient, Ben can help him escape. Radzinsky and Horace come to question Sayid, but he gives them no answers. When Ben returns to give Sayid a sandwich, he is met by his father Roger Work Man, who throws the sandwich to the ground and demands that Ben returns home. This scene gives us a better look at Ben's childhood, and the events that would eventually cause him to murder the DHARMA members, including his own father. Horace suggests to LaFleur that they bring Sayid to Oldham (a mysterious interrogator who lives in the jungle). When they bring Sayid to this man, Sawyer tells him that "he's our you" (meaning that Oldham is the 'torturer' for the DHARMA Initiative). Oldham provides Sayid with a truth serum, and it works. Sayid almost tells them about "Sawyer", but is interrupted by the ever-annoying Stu, who is most interested in Sayid's knowledge of the Swan station. Sayid pours out everything he knows - crashing in Flight 316, in Flight 815, and his knowledge that the Purge will eventually kill them all. Our annoyance of Radzinsky only worsens when the DHARMA members have a meeting to decide what to do with Sayid. The vote goes in favor of Radzinsky's proposition, and LaFleur is forced to go along with them. 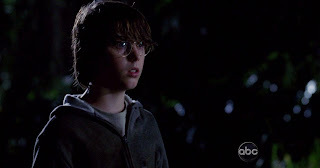 Sawyer goes to Sayid's cell, giving him a chance to hit him and run. Sayid refuses, claiming that he knows what his 'purpose' of being on the Island is. Back at the Barracks, an arsonist sets fire to a DHARMA van, crashing it into one of the houses. We later see that young Ben uses this diversion to free Sayid from his cell. As Sayid and Ben run from the Barracks, they encounter Jin. Sayid knocks Jin out, and, in one of Lost's most shocking moments ever, shoots young Ben. This episode ends with one of the most shocking cliffhangers in Lost history. Could young Ben really be dead? It would defy Faraday's theory of 'whatever happened, happened'. I personally see no reason to believe that Ben is actually dead. It would be difficult for a kid to survive a gunshot at that range, but I'm sure there could be ways for him to survive. Perhaps Jack will have to use his super-surgeon skills to rehabilitate young Ben; but would Jack really do surgery on Ben for the second time? "He's Our You" has tremendous character development. At lunchtime, we see that Jack has no problem sinking into the background, as opposed to his previous on-Island life as leader of the survivors of Oceanic Flight 815. Hurley is fitting in just fine as a DHARMA chef. Kate seems to be having trouble accepting that Juliet is with Sawyer. I hope that they put an end to this love quadrangle soon; Jack should be with Kate, and Juliet should be with Sawyer. Kate has done too much flip-flopping, if you ask me. Another highlight of this episode is seeing more insight into Ben's childhood. His abusive father gives Ben more motivation to lead the Purge, and eventually become the leader of the Hostiles. Ben has been desperate to escape from his life at Dharmaville, and his father has been no help to him. I usually don't feel sympathy for Ben, but I felt differently this episode. He finally thinks that he can escape from his life, and the one person he trusts, Sayid, shoots him. When I started thinking about this, it really is a complicated tale of character development: Sayid's interactions with old Ben in the future caused him to shoot young Ben in the past, which was really his future. This episode also shows us that Sawyer loves his life as DHARMA Head of Security. He has really become loyal to DHARMA after living with them for three years. I'm glad that he at least gave Sayid the chance to escape, because I wasn't happy after he succombed to Radzinsky's proposition. Overall this episode is a fantastic addition to Season 5, and possibly the best episode this season.